[T]o understand the rise of mass incarceration in the United States, we must look to the American public. 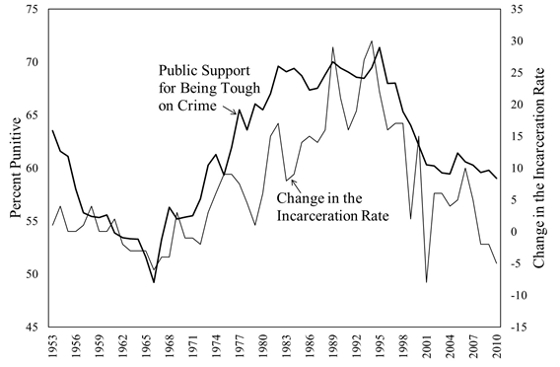 In recent research, I show that the U.S. public’s support for being tough on crime—i.e., the public’s punitiveness—has been a fundamental determinant of changes in the incarceration rate…. [The figure above] plots the public’s punitiveness and the change in the incarceration rate. Strong similarities emerge. The correlation is an impressive r=0.82. Statistically, this relationship holds even when controlling for the crime rate, illegal drug use, economic inequality, and the strength of the Republican Party. Based on this statistical model, if the public’s punitiveness had stopped rising in the mid-1970s, we would expect approximately 185,000 fewer incarcerations each year—about 20% of the incarceration rate. The expected influence of the public’s attitudes is larger than any of the other variables in the statistical model. Furthermore, an analysis of the public’s punitiveness and congressional hearings on crime suggests that public support for being tough on crime precedes congressional attention to this issue.